In 1953, someone at Swanson severely overestimated the amount of turkey Americans would consume that Thanksgiving. 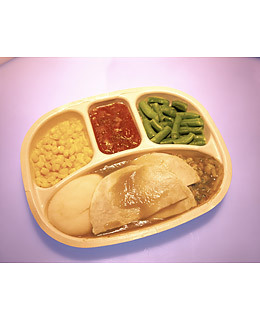 With 260 tons of frozen birds to get rid of, a company salesman named Gerry Thomas ordered 5,000 aluminum trays, recruited an assembly line of women armed with spatulas and ice-cream scoops and began creating mini-feasts of turkey, corn-bread dressing, peas and sweet potatoes  creating the first-ever TV dinner. Thomas later said he got the idea from neatly packaged airplane food. See the Top 10 Things TIME Is Thankful For This Year.